Stuffed pasta specialty, sometimes accompanied with chicken, beef or vegetable broth, a typical dish originating in Swabia, very popular as German food. 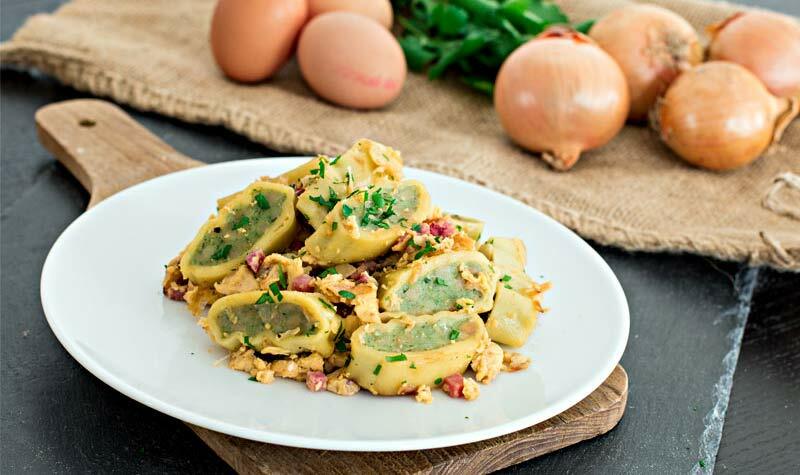 The Maultaschen is composed of many times stuffed meat combined with vegetables, the recipes of the filling are varied today, covered in pasta. Originally the filling contains beef or even sausage, vegetables such as onions and often spinach, but there is a wide variety of fillings, such as ham, roast remains or even only vegetables. According to the story the dish was developed in a monastery of Maulbronn, from where the name is taken, said dish was made to hide the meat in the Lenten season when it was forbidden to eat meat. Another version of the story is that it was elaborated by Protestant families who liked to eat meat when tradition was not allowed by religion. In any case the origin of the dish is culturally traditional folk of humble origin. Nowadays it is found in all German supermarkets, even when prepared and with a wide variety of types of fillings. The preparation is relatively simple but it involves preparation time, it could be said that it is not a quick recipe to make, the filling is prepared initially with chopped vegetables together with moistened bread. Then add spinach, ground beef. Then the resulting mixture is wrapped in a moist paste, which is often an egg, the shape of the pasta bag is usually square or rectangular, but there are also round versions of approximately five centimeters. At the time of serving the fillings you can be inside a broth as a complement to a soup, although there are different variants such as sliced ​​and fried with more vegetables. This dish is undoubtedly a classic in the restaurants of typical German food, some Biergartens or even the popular foodtrucks with street food.